I drink coffee out of the same cup every morning. 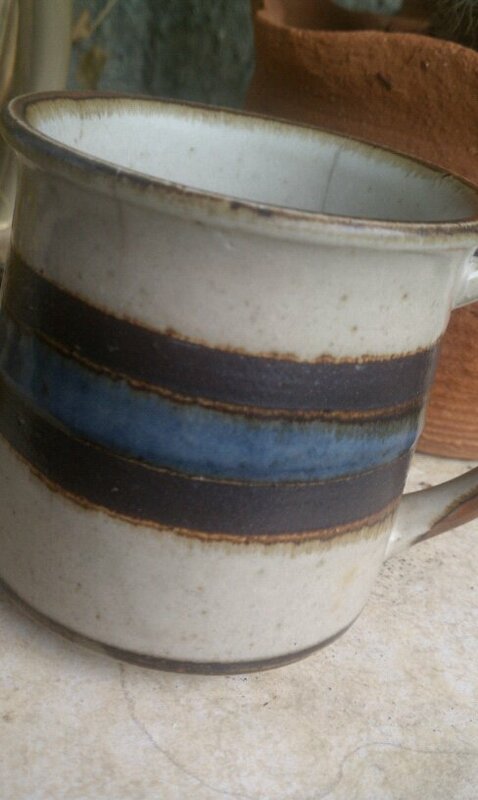 It’s a hand-made pottery cup that’s painted a rainy grey color, with bands of blue and black. The handle is just right for my hand and the cup has the most perfect lip for sipping. It’s been a part of my life for as long as I can remember and this year I will be forty-three. I hope I drink all the wisdom before the cup cracks! It used to be my mother’s cup. She drank her coffee out of it every morning before she went to work and on the weekends she would have this same cup in her hands with her ever-present cigarette. I didn’t always get along with my mother. It would be safe to say that in my later years just before she passed away, things were harsh. For years after she died I had a hard time remembering the good times and the woman she truly was. All I could embrace was who she allowed herself to become after she was diagnosed with breast cancer. On a recent misty morning I was contemplating life, motherhood and the passage of time while drinking from this cup and it dawned on me. I may have lost my mother the year before I became a mother myself, but every single morning I drink from her cup of wisdom. I always think of her when I’m drinking from this cup and I draw from the lessons of her life – the do’s and don’ts, the triumphs and the mistakes. This is how she shares her wisdom with me and this is how I hear her. One day the cup will break. It already has a significant crack in it. I just hope I drink all the wisdom first. *disclaimer: this essay was first published in “Iron Butterfly: Earthbound and Rusted” http://morigainne.wordpress.com/2011/02/10/my-mothers-cup-of-wisdom-2/ . Please note that IronButterfly will be taken down soon. I just wanted y’all to know this isn’t the first time I’ve shared this story of mine.